Art Memory Place is the second teaching/exhibition project organized through the NYU Program in Museum studies, connecting up museum studies students to other students in NYU, in which the students think through an important set of issues via the medium of creating an exhibition. The first project was the DSNY exhibition and archive we created in 2007/2008. This time, Museum Studies Students worked with Public History MA students and the Grey Art Gallery to curate an exhibition about the Triangle Shirtwaist Factory Fire and its commemoration over the past 100 years. This year is the centennial of the Fire, a landmark tragedy in which over 100 young women (primarily Jewish and Italian immigrants) died in a fire in a garment factory in a building that is now a part of NYU. 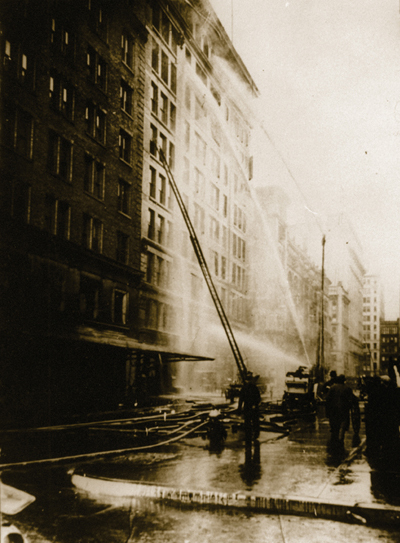 The fire had huge impact in NYC at the time (300,000 people took to the streets for the funeral ceremonies) and continued to resonate, greatly impacting the NY labor movement, and becoming a beacon for continued struggle for fair labor conditions. The exhibition is on at the Grey until July 9. The website, with text and images written and selected by the Students is here. There are a number of important events being organized to celebrate the Centennial of the Fire, which have been amalgamated by the Remember the Triangle Fire Coalition including the annual Chalk project, began by artist Ruth Sergel, in which volunteers visit the homes of the victims and inscribe their names in chalk on the pavement. The artist LuLu LoLo will perform her piece Soliloquy for a Seamstress at NYU amongst other places on March 19th. And a new HBO documentary will also premiere.